I have always wanted to alert the Home Automation System if the smoke detectors were triggered. I had previously thought of using a microphone near one of the units to pick up the sound of the siren, but this seemed a little kludgy to me. Alternately, I noticed that there is a third red wire that connects to each smoke detector. I have always wondered if this could be used to monitor any alarm conditions. However considering that this is a system fed by 120V, I have always hesitated to put test equipment onto that line. Then in the Spring of 2004, one of our smoke detectors started to chirp periodically. Unlike previous times, a new battery did not resolve the problem. Since I have heard that smoke detectors should be replaced after 10 years, I decided to change them all as they are all the same age. After purchasing a new set of detectors, I noticed an interesting device on the "Interconnect Diagram" on the enclosed instructions. It was an optional accessory called the "Lifesaver Relay Module Model 120x". Connection diagram for the new smoke detectors from Kidde. Note the Relay Module (#120x) on the network. The above diagram shows how the system is interconnected. Each smoke detector is supplied power from the 120V power line via the Black and White wires. In addition, there is a Red wire in the system that connects only to the smoke detectors' red wire. This is obviously the means by which they communicate with each other, and I decided to investigate the voltage on this line during an alarm event. alarm's sensing circuitry has about 24 KOhms of input impedance. Being a smoke detector, safety is paramount. This new addition must be single fault tolerant against obstructing the interconnect feature. With a variable resistor, I found out that any load that I connected to the red wire must be greater than 300 Ohms. In other words if a resistor smaller than that value was connected from Red to White, the interconnect feature would not work. With this result, I know that I can draw only a few milliAmps of current from the interconnect output, which rules out a relay. Another requirement I have is that this interface must work even in the absence of line power. However, I did not want to connect the 12V power (which is battery backed) from my security system to the smoke alarm without isolation. So any relay driver that I would build would have to have its own power. Since this was not attractive, I decided that the best switch to use in this application was an opto isolator. current is drawn from the interconnect circuit. An opto isolator essentially couples current from the LED circuit to the transistor circuit by using an optical connection and the gain of the transistor. You can speak of a Current Transfer Ratio in the opto isolator: the higher you drive the LED current, the more base current is generated, and the more collector current you can have in the output transistor. A CTR of about 1 is considered a good rule-of-thumb. So for every mA that you drive the LED, you can estimate a collector current of 1mA. With some experimentation, I found that the largest series resistor that I could use for the LED was about 1.6kOhms. I settled on the above values to ensure margin against excessive loading and proper turn-on of the LED (two resistors so that if one should short out, the other will limit the maximum load on the interconnect circuit). Since the maximum current in a sensing zone of my Security Node is 5mA, I could connect the output transistor directly to the zone's wires. Since only three parts are needed, I could mount the whole thing on a small perf board and housed it inside an empty medicine bottle. 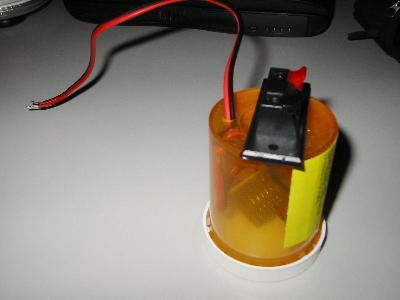 The finished interface module housed in an old prescription medicine bottle. the pigtail leads connect to the smoke detector network. Since I would be running a long cable from the site of the smoke detector to the Security Node, I used a two terminal speaker connection block for the alarm interface. This allows easy connection of the long cable, and disconnection for troubleshooting. This cable was connected to a normally-open circuit on the Security System. White and Red wires from the smoke detector. I reprogrammed the system to incorporate the new interface. Now if smoke is detected the Home Security System will be triggered, and the system will send me a text page. In the future, I may add additional smarts such as turn off the two HVAC systems etc. 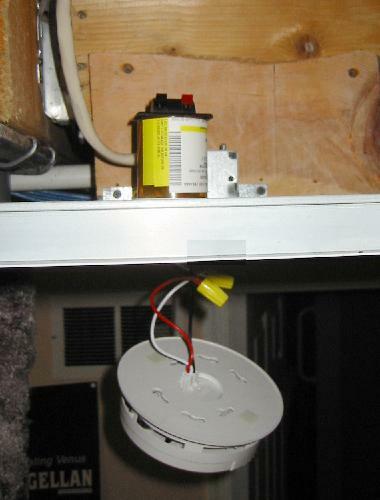 April 2004 - New smoke detectors installed into home. 15 July 2004 - Smoke detector interface installed. 2013. New smoke detectors installed and they are still compatible with this relay module. June 2014 - Received a note from Anthon Pang that interconnected CO sensors use a pulsing signal on the common line to indicate alarm (vs steady signal from smoke sensors). June 2017. James Campbell's version of this project. Check it out. Jan 2018 - Ed Bade sent me the link to the Kidde SM120X page (added above).